"This a great white bread recipe for your bread machine. The use of dried buttermilk powder allows the use of the delayed timer feature of your bread machine. Wake up to fresh bread!" Add ingredients to bread machine pan in order recommended by your manufacturer. Use medium crust and white bread settings. I use less yeast during hot, humid summer months. 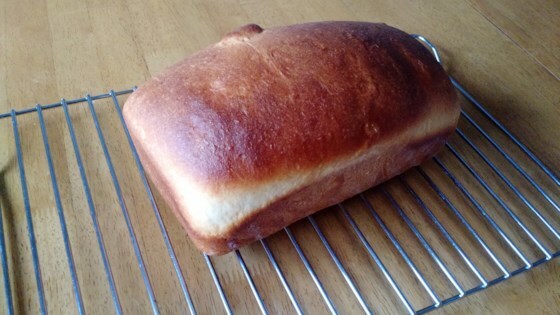 See how to make gluten-free white bread in your bread machine. I tried this recipe twice. I don't know what it is, but I ended up both times with a loaf that was about a third the size it should be, and far too moist and dense. Disappointing! A delicous golden loaf of bread. My family loved it. Bread was very rubbery and didn't have much flavor despite following the recipe exactly. Would not make again. Tastes even better than the buttermilk bread I can buy in the store. Very easy to put together and a really good white bread for sandwiches.